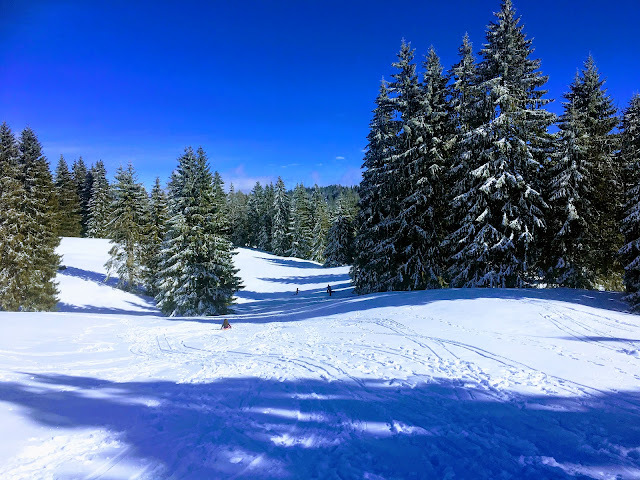 On the last day of Eliana's Ski Week Break we took the mountain train from Nyon to La Givrine (just past St Cergue) to enjoy some Winter walking and sledding with friends. Winter walking trails are groomed and maintained so that you can walk on them without needing snowshoes. Most trails in the Winter require snowshoes otherwise you would sink into the deep snow while wearing your normal Winter boots. We took the mountain train from Nyon. It was about a 45 minute train ride to La Givrine. The trail starts just behind the train stop in La Givrine where you will see a trail for both cross country and for Winter walking. If you walk the entire trail you will end in Le Vermeilley. We chose to only walk half of the trail to La Genollière. In La Genollière you will find a small mountain chalet that serves fondue, sausage, warm drinks and a few other simple mountain eats. The children enjoyed a hot chocolate and some fondue and dried sausage before heading back into the snow for some sled riding. The walk from the train station to La Genollière is uphill. This makes for a nice reward when returning afterwards. We brought sleds with us so that the children could ride back downhill from the mountain chalet on the same path we had walked up. Along the way there are several markers that let you know how much further you have to go and so that you know you are on the right path. There is a parking area for about 20 cars right in front of this train stop and where the trail starts. You could also drive here rather than taking the train, however I have driven past this area and the car park is typically full - if driving I would go early. There is a sledding hill just opposite the street of the train stop. After we did the walk the children went sledding down the hill a few times before we went back home. For more information on this hike, click here or here or for a map here. For more information on the mountain restaurant click here. There is also a restaurant at the train station and trail head in La Givrine. For More Photos From Our Outing Click Here.